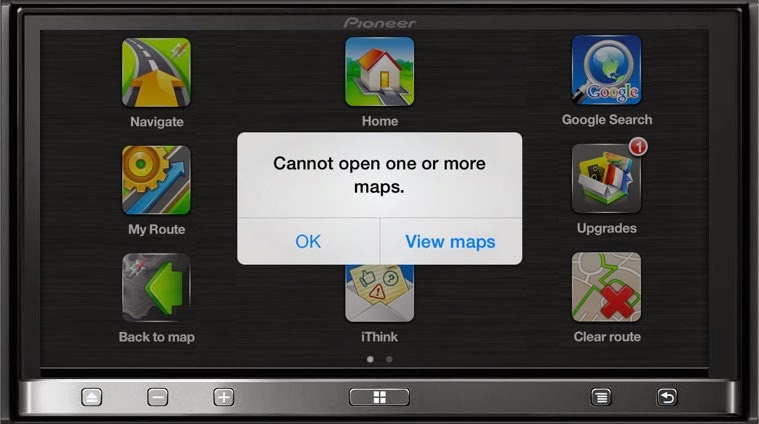 Navfree GPS is one of the better navigation apps available for AppRadio Mode. The best feature is Google Street View which is absent in most other applications. The app is available in different versions depending on the country you need it for. Recently the US version of the app (Navfree GPS USA + Street View) was updated to version 2.3.66 with new map data being added to the update (February 2014 map data). But updating the app alone doesn't mean it will continue to work. Here's what you will also need to do to get it working. You have to download the latest map data from within the app. In my case, I had to download the maps for California. I found out about this when I wasn't home, which meant I had to use my cellular connection to download the map. It's a good thing I have a grandfathered unlimited data plan from AT&T, so the 224 MB download wasn't too bad over LTE. How to download: To get the latest map data, you have to be disconnected from the AppRadio and preferably be using a wifi connection as the files are large. From the Navfree Menu, find 'Upgrades' and then 'Maps: USA & Canada' (in my case). From there, download the map you want. If you had installed the previous update already, you will find it in the 'Updates' list. All US state maps are free to download. Canada maps will cost you $3.99. Prices for other countries vary. Also, file size varies considerably too. Alaska, for example, is only a 14 MB download, while California is 224 MB. Navfree is available on Android in addition to iOS. You can download the latest version of the US app from the App Store or Google Play today.